As a new Designer at Joy Clair, I was given the opportunity to be a part of their new stamp line Color by Faith. Let me just tell you that I am having so much fun!!! At first I was hesitant about coloring, doodling, scribbling & stamping in a Bible. I mean YIKES...this is the good book we are talking about here. But the creative side of me won and stamp away I did. 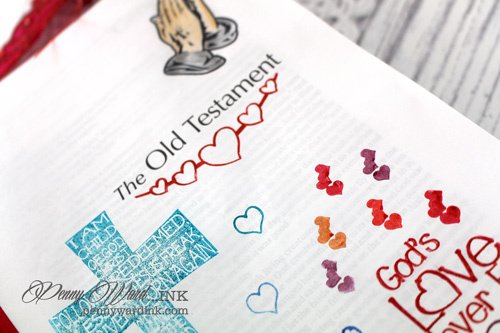 Come on over to the Joy Clair blog to find out what this new trend of Bible Journaling is. And because I just couldn't stand it, I made a card also.